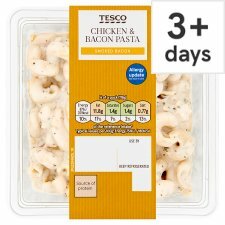 Cooked pasta in a mayonnaise dressing with cooked chicken breast and smoked bacon. Cooked Pasta (Water, Durum Wheat Semolina), Water, Rapeseed Oil, Cooked Chicken Breast (7%), Smoked Bacon (5%), Pasteurised Egg, Cornflour, Spirit Vinegar, Concentrated Lemon Juice, Salt, Sugar, Parsley, Black Pepper, Citrus Fibre, Rice Starch, Mustard Seed, Potato Fibre, Dried Egg White. Smoked Bacon contains: Pork, Salt, Preservatives (Sodium Nitrite, Potassium Nitrate), Antioxidant (Sodium Ascorbate).